A perfect wedding in Italy with a Mediterranean touch, care, fun and a lot of love. Wedding in Puglia, true Mediterranean poetry for the happiest day of your life. Puglia is a wonderful region in Southern Italy famous for the beautiful landscapes, gorgeous cities, and delicious food. A wedding in Puglia is a great idea for couples who enjoy the authentic flavors of the Mediterranean and the beauty of centennial olive trees. Puglia is also known for its traditional gastronomy that is simple yet tasty and very healthy. Family recipes are handed from generation to generation in the beautiful frame of the olive trees, red soil, and warm Apulian weather. Have you ever seen the Trulli? This kind of construction is characteristic exclusively of this area of Puglia: its building dates back to the 17th century as a consequence of high taxes on properties. 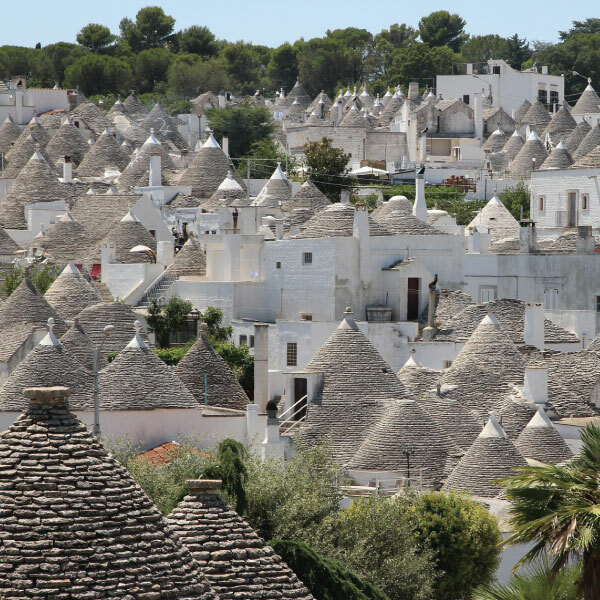 In fact the people of Alberobello perfectioned a construction method that allows the dismantling of the Trulli in a very short time in case of inspection from the local police. This way they could avoid tax payment or fines. Discover the charming beauty of the Trulli, classified among the UNESCO World Heritage Sites. Mysterious and enchanting, the Trulli can give you an extra touch to your romantic wedding in Puglia. Furthermore, in addition to offering the ideal setting for a nice activity for your guests, for all history-lovers, there is the opportunity to get married in a real Trullo! This is definitely an unconventional location for a wedding in Puglia, right? Salento is a wonderful area located on the eastern coast of Puglia. The area is considered to be the “young and party” area of the region for its discotheques, clubs, and resorts. Last summer I had the pleasure to organize a very nice wedding in Puglia in the small town of Galatone. The couple was just perfect: happy, beautiful and in love. The religious ceremony took place in the church of Galatone, followed by a romantic photo shooting through the streets of the town. With my staff, we organized the reception at a local farm, exclusively booked for the newlyweds and their guests. 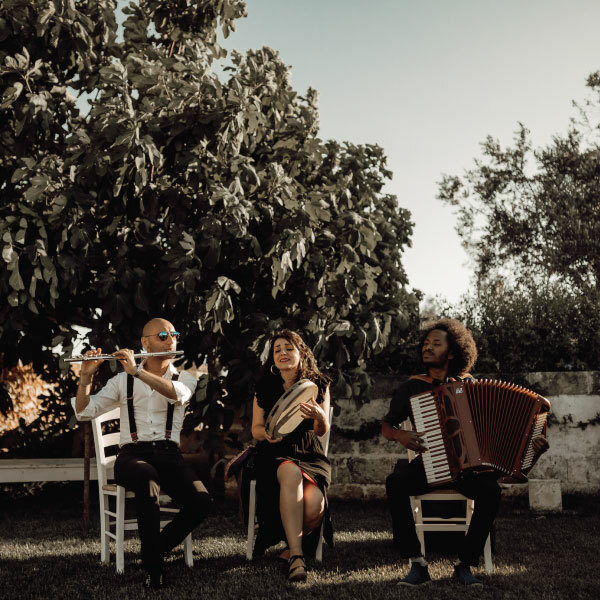 Upon arrival, the newlyweds were welcomed by Salento’s folk music called “pizzica”. The traditional music entertained the guests during the cocktail. All the food was locally sourced and the menu was based on traditional recipes from Puglia. 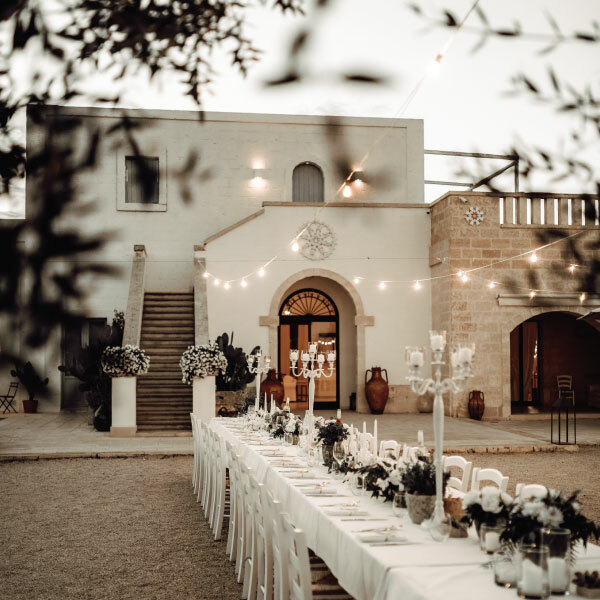 Discover the charm of an authentic wedding in Puglia: The dinner table was set in front of the farm: large imperial tables, decorated with rich chandeliers, white flowers, succulents. The bride wanted to recreate a mix between the atmosphere of the Mediterranean Sea and the wild nature of the hinterland. No need to say that she was very pleased with the result. Finally, after very emotional speeches and endless hugs, the bride and the groom cut the cake while we opened the sweet buffet. Dancing in the farmyard did not stop until the next morning! IF YOU ARE PLANNING YOUR WEDDING IN ITALY, ASK ELISA PRATI! Together with her experienced team of professionals, Elisa can help you select the most amazing wedding ceremonies, stunning wedding locations, delicious Italian food and wine and the best entertainment. Elisa Prati will organize your wedding in Florence, Rome and Venice as well as weddings on Lake Garda, Lake Como and many other beautiful wedding venues. Elisa will take care of you and your guests from the moment you arrive until you leave with luxury services and bespoke events. I love organizing weddings in Italy and sharing with you my passion for Italian beauty and hospitality. Let me take care of your perfect wedding in Italy. Let's talk about italian wedding venues, dresses, cakes, photographers, details, and everything you need to make your wedding dream come true. Let me guide you through the most beautiful wedding locations in Italy: Venice, Capri, Rome, Lake Como, Lake Garda, Florence, Tuscany, Amalfi Coast, Sicily; I can suggest you the perfect place to fulfill your wedding dreams.